Keshubhai Patel is an Indian politician who was the Chief Minister of Gujarat state of India in 1995 and from 1998 to 2001. He has been member of Gujarat Legislative Assembly six times. He was a member of the Bharatiya Janata Party from the 1980s. He subsequently left the BJP in 2012 and formed the Gujarat Parivartan Party. He was elected from Visavadar in the 2012 assembly election but later resigned in 2014 due to ill health. 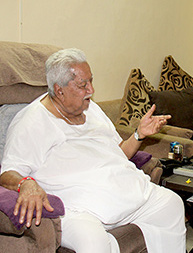 Keshubhai Patel (born 24 July 1928) is an Indian politician who was the Chief Minister of Gujarat state of India in 1995 and from 1998 to 2001. He has been member of Gujarat Legislative Assembly six times. He was a member of the Bharatiya Janata Party (BJP) from the 1980s. He subsequently left the BJP in 2012 and formed the Gujarat Parivartan Party. He was elected from Visavadar in the 2012 assembly election but later resigned in 2014 due to ill health.